The 2018/2019 Executive Committee of InterDev is thrilled to announce that our Annual General Meeting (AGM) is scheduled for Lent Term, Week 10. Ahead of the upcoming AGM, the current Executive Committee is hosting an informal drop-in session for all those interested in society leadership positions on Wednesday, 27th February from 12:00-15:00 in Room 2.03, New Academic Building. Come along with any questions or concerns. In the meantime, see below for role descriptions, with blurbs written by the current Executive Committee. General prerequisites: Applications are only open to current undergraduates and members of InterDev. We advise interested postgraduate applicants to consider executive involvement in our partner society, DESTIN. The President’s role is to oversee the society’s activities as a whole. You’re responsible for developing ideas to guide InterDev and our activities into the coming year. In addition, you have responsibility for maintaining relations with the Students’ Union, from ensuring compliance to communicating with relevant officers on society activities. You take charge of managing your team and ensuring everyone is contributing and involved (which is definitely easier said than done). Plus, formal/informal outreach and maintaining partnerships comprises a very time-consuming part of your role. Some responsibilities super specific, and contingent on your team’s involvement: for example, sending the weekly newsletter, an event proposal form, or sponsorship application. Versatility is key. Ideally, the President should be very enthusiastic and willing to devote lots of time and energy to the society’s development (approx. five hours a week, inc. before Michaelmas Term 2019). Whether meeting other student-run initiatives or introducing an event, your role is unavoidably outward-facing, so it’s important to be a clear communicator and confident public speaker. An interest in international development (academic or otherwise) is crucial. Key responsibilities include supporting the president in the running of the society; this can include filling in for the President when necessary and working with the President in key decision-making and outreach (within the LSESU, i.e. to other student societies, and outside campus, i.e. with organisations or potential partners). Also, you play a role in event organisation and management; for instance through liaising with outside speakers and the co-ordination of event logistics. The Secretary’s role on the Executive Committee is to act as a liaison between society leadership and society members. In addition, you should be responsible for administrative tasks, including booking venues, sending out society emails and taking detailed meeting notes on all internal committee meetings, society meetings and events. Plus, you are encouraged to get involved and lend administrative back-up to event project reams. The Secretary should attend all society meetings and events, and aim to devote a couple hours a week to completing administrative tasks. As an official liaison between leadership and members, your role is socially demanding and it’s critical to be an effective, clear communicator with admirable time and information management. This position is responsible for managing the reputation of the society; this encompasses marketing events, messaging with individuals, and posting on our social media outlets. Essentially, the duty is to use media and communications to build and maintain a positive relationship with our society members as well as with the LSE student body and the general public. The ideal person for the job is creative, works well in a team, and has great communication skills. Being Treasurer for LSESU InterDev is an immensely rewarding experience and will allow you to learn about the inner financials of the student society. As a Head of Events, you come up with and organise events that would cater to the interests of our members. You liaise with external organisations and individuals, as well as work on logistics along with other society members. You also manage a team of events sub-committee who assist with the above. How would you describe your experience at KPMG? I have been with KPMG in East Africa for several years and had the privilege of being part of one of the first teams that began doing international development work in the region at KPMG. I joined KPMG in a junior position and eventually became Partner. Through my experience at KPMG, I have been able to grow and learn continuously and I am now in a position to grow and develop others which is very fulfilling. When I first joined KPMG, it was a small office in Nairobi with a small team. We now have four offices in the region (Kenya, Uganda, Tanzania, Rwanda) with over 1,000 staff. It has been exciting to see and experience these changes and growth as well as be able to work in different sectors and service areas. It is important to take initiative, be proactive and be open to different challenges which I have found has enriched my experience and opened up opportunities. What inspires you to work in international development? My inspiration for working in development has probably changed over time. Development initiatives usually take time and are interconnected. They may address basic needs such as health and education but also help in developing economies, creating jobs and reducing inequalities. Not only am I inspired to see how development programmes make a difference to the lives of the poor and vulnerable, but there are development issues facing us globally such as climate change. Being involved in initiatives to address these is very inspiring knowing that it will have an impact on a wider scale. For example, I have been involved as a fund manager in a flood resilience programme which ran a competition for innovative solutions to withstand the shocks and stresses of flooding in South and South East Asia. One of the initiatives selected was building floating houses in Bangladesh to enhance the resilience of households and communities before, after and during floods! Being exposed to such innovative solutions that may have a transformational impact is very inspirational. How did you make the transition from accountancy and finance into International Development? After graduating from LSE, I qualified as a Chartered Accountant and worked in finance for a year in the steel industry before moving to Kenya. I began working in management consultancy at KPMGin Kenya. The skills I developed in private sector became very relevant to the work we began to do in Development at KPMG in East Africa where we started to experience a greater demand for private sector practices in the Development sector, especially to build organisational and institutional capacity. As programmes became large, a need for fund managers or management agents grew, particularly to manage the fiduciary risk of the funds in development programmes. Managing fiduciary risk means ensuring the funds are accounted for properly and used for the purposes intended to ultimately make an impact in the programme’s focus area such as climate change, health, agribusiness, financial inclusion etc. Can you talk about a project you’re currently undertaking, or a project you’ve done in the past? What was it, how did it come about, what did you achieve etc. I have worked in programmes in a range of sectors which include health, resilience, agribusiness, governance and financial inclusion. One of the large programmes that I am currently involved in is MasterCard Foundation’s Funds for Rural Prosperity (FRP). FRP is a US$50 million challenge fund being implemented over seven years to extend financial services to people living in rural sub-Saharan Africa, with a focus on small holder farmers. KPMG is the fund manager of this programme. FRP’s aim is to improve 1 million lives with better financial access. This will help contribute to alleviating poverty. FRP came about as people making a living in agriculture make up two thirds of Africa’s workforce and mainly live in poor rural areas with limited access to finance. The challenge fund runs competitions to select innovative solutions that expand and deepen financial inclusion for the poor in rural areas in Africa. The fund is just over halfway and results from the participating projects are showing that the 1 million target may already have been reached which is a key achievement. The fund is also making an impact in creating jobs, improving financial literacy and reaching customers that would not normally have access to finance. What was your biggest/most memorable achievement in your current role? There have been so many. One of the most memorable was being instrumental in KPMG being selected to manage the Capacity Building Trust Fund in South Sudan. At the time, the Comprehensive Peace Agreement had just been signed in 2005 to end the civil war and this Fund was set up to help form the Government of South Sudan and support recovery. Being involved in such an important nation building initiative in a post conflict context was a very memorable experience. How do you think you, as well as your team at KPMG, have made a difference to the field of International development? KPMG IDAS in East Africa has made a difference in development through its fund management work which it began over twenty years ago. For example, over the years it has been involved in programmes that: support agricultural transformation; facilitate adaptation to climate change and innovation in renewable energy access; build countries’ resilience to climate change, shocks and stresses; and strengthen national capacities to deliver health services. These are just some of the areas where KPMG has been involved in making a difference. The following link provides useful information and detail on the work done and the difference it has made in the range of sectors we work in: IDAS information. 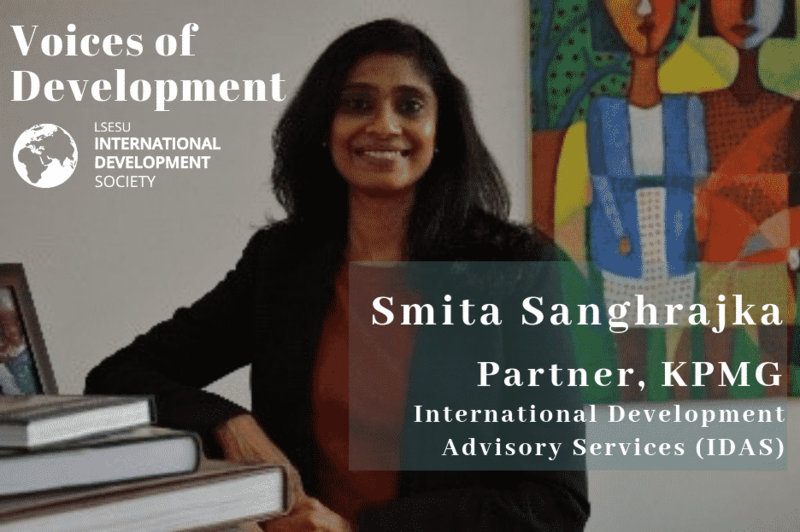 Smita Sanghrajka is a Partner in KPMG’s International Development Advisory Services (IDAS) in East Africa with over twenty years’ international development experience. As Engagement Partner, Smita has been leading various fund management programmes with Regional, Africa and Global reach in a range of sectors such as Resilience, Financial Inclusion and Agribusiness. Not only has she spearheaded various service delivery performance initiatives in IDAS, she has provided quality assurance in large programmes such as Global Resilience Partnership and Funds for Rural Prosperity. In addition, she has oversight of Compete, Check and Manage services in IDAS. Smita has worked with various local and international non-governmental agencies as well as private foundations, public sector players and donor agencies such as DFID, MasterCard Foundation, SIDA, USAID, Z Zurich Foundation. She has experience in grant and fund management, programme design and management, financial management and sustainability, performance improvement, organisational development and capacity building. As a testament to her tenacity and determination, Smita has conquered the tallest freestanding mountain in the world and Africa’s highest point– Mount Kilimanjaro. She brings this same energy to the workplace with a solution-oriented approach. Although her development career began with the firm, she diversified her path as an independent consultant working with a range of entities in various countries such as Guyana and Bangladesh, before returning to KPMG. Over twenty years’ of development experience contributing to transformation and change, particularly in East Africa, has only driven her passion for seeing impact at community level further. She has been involved in various education and health initiatives. Currently, Smita is a Board member of Dignitas Project. Dignitas Project operates in informal settlements around Nairobi to empower teachers, students and communities to transform schools in Kenya. She is a graduate of the London School of Economics and a UK qualified chartered accountant. Tell me about your experience at the World Bank! How did you end up working for it? 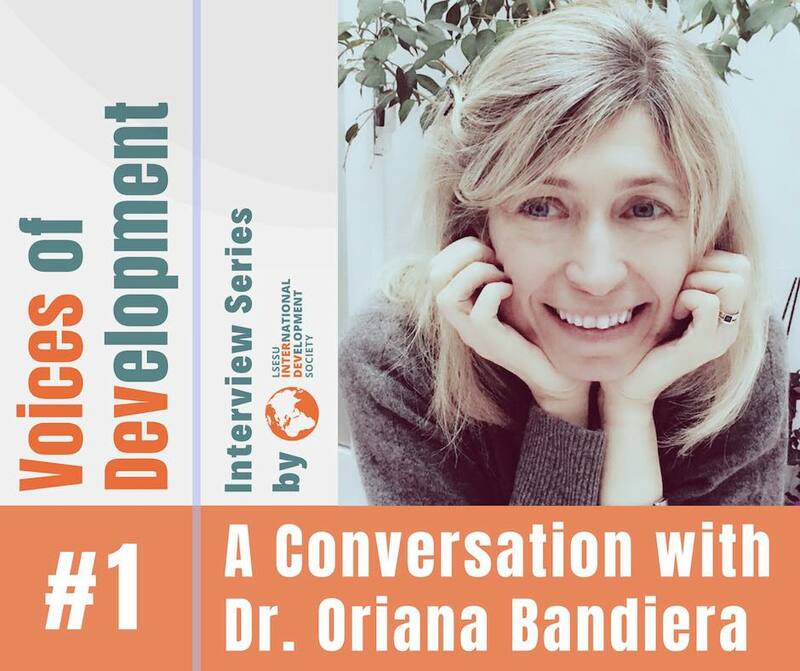 I started working at the Human Resources Department of the InterAmerican Development Bank (IADB) right after I finalized my HR Master’s at George Washington University. During the three years I worked at the IADB I completed my MBA degree at the University of Maryland. HR is a very wide field that requires sound knowledge of how the different pieces of the business puzzle fit together and what is their impact on the overall strategic organizational level. Both degrees plus the very valuable IADB experience provided me with a wide array of skills and tools to take my HR career forward. My next job was a short temporary contract with the World Bank doing recruitment for their Information Technology Department. Shortly thereafter I joined the HR Department. One thing lead to another, and luckily I’m still working here, 15 years later. How is it like to be an HR at the World Bank? What do your duties entail? Working in HR Client Services at the World Bank is exhilarating, as the scope of work is so wide and our potential for impact so crucial. We support all aspects of the life cycle of staff’s careers across 150+ countries where they are employed. This has a direct impact on the Bank’s ability to succeed at carrying out its mission of eradicating poverty, so it’s a pretty exciting and meaningful job. Could you tell us more about World Bank’s selection process? What qualities do you look at? We carry out selection processes in interview panels which are comprised by the hiring manager and a set of relevant colleagues to the position we are looking to fill. I participate in recruitments for management positions only as there is not enough time to participate in all recruitments. I cannot single one most important thing to be hired, it is a set of qualities/experience, and their complexity increases depending on the seniority of the job. We typically look at what we call the “T” model, i.e., someone who has in-depth knowledge of a specific area and at the same time has broad expertise that will allow the person a wide scope of action beyond the specific area of expertise. Aside from the professional aspect, behaviors are also very important. We ensure that those we hire have strong people skills, can work in teams, deal with conflict in a constructive manner, etc. Also, we have a very diverse work environment, as our staff are from all over the world. What was your most memorable experience at the World Bank? My most memorable experience was when I headed the HR Team that supports Latin America. It was a huge and rewarding challenge. Other experiences I particularly value are the visits to our offices in the countries. I’ve been to Bolivia, Uruguay, Argentina, Peru, Ecuador, El Salvador, Haiti, Dominican Rep.ublic, Jamaica, Georgia and soon India. The World Bank has been substantially reforming itself for last decade or so; as an HR partner, have you noticed any such changes in your work? Yes, lots of changes, as HR has been reorganizing itself in order to best support the staff and the business in its different configurations throughout the years. The constant changes require that one has to keep learning, adapting and growing. No two days are the same, there are always new challenges. 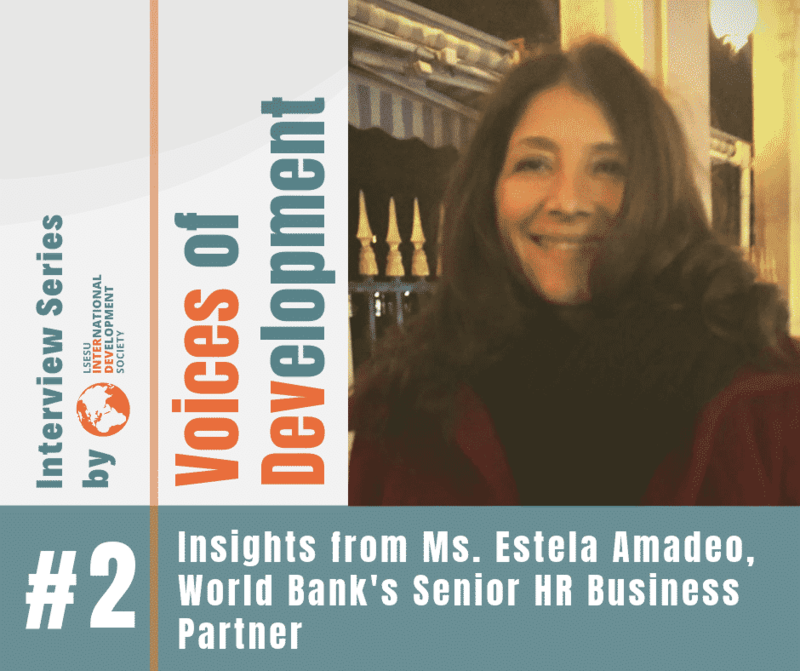 Ms. Estela Amadeo is a Senior HR Business Partner at the World Bank. She provides advisory services to the Bank’s client teams, interacts with World Bank’s clients, and contributes to business and talent strategy, policy formulation and implementation of people management related agenda. Find out more about her here. Q: When did you realise you wanted to study development economics? I come from a very poor part of a rich country, and so for me, the question of development was always the only question that there was. Growing up in Sicily in the 1980s and comparing it to Milan, which is in the same country, the difference was enormous. I always wanted to know why that was the case. Q: Was there an epiphanic episode when it all ‘started’? I found that studying in Italy in the 1990s was all about macroeconomics. UntilNick Stern of the Stern Report on Climate Change – he is a colleague here – came to teach a 1-week course. At that time he was working on Palanpur. Palanpur is a village in India, where he and his co-authors have been collecting information about every household for, now, 60 years! When he told us at Bocconi – it was maybe at the third round of these surveys – that “we have been going here for 30 years” – I was so amazed that somebody’s day job was to go to a village and study the economy of the people of that village. And I thought, that is what I want to do when I grow up. And… that’s how the story goes! Q: Tell me about your research! What is your latest project?